Description: NS 262 is lead by a lone BNSF unit. Description: NS 261 is lead by the same BNSF unit that led 262 earlier in the day. Description: Nothing but good power on this Westbound. 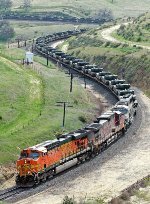 Description: BNSF Clovis, NM to Alliance, TX intermodal train Q-CLOALT1-29A - BNSF 7434, BNSF 655, 71 loads, 0 empties, 6079 tons, 6295 feet - North Lake Wanda - BNSF Fort Worth Subdivision. Description: Four trains can be seen in Naperville at once here. Description: NS Train 270 leaveing BNSF's East Thomas yard in Birmingham, Alabama and going to the Honda Plant in Lincoln, Alabama. Description: Two units of the dtring of five I caught the previous day. Description: The 599 was originally the 666 until renumbered due to concerns by some rather supersticious employees. Description: Ex ATSF 666 waiting for work at BNSF's Topeka Shops.